While most kids were running around with their friends, 11 year old Sid Griffith could be found at a local dude ranch leading small children on ponies so that he could get riding time. With his father complaining that it had taken him "18 years to get off the farm", the successful attorney was unwilling to purchase a horse for his passionate son. Growing up, Sid's mother believed that young men required a staunch private school education, had a social obligation to learn ballroom dancing, and should learn to ride on fancy gaited saddle horses. Sid cooperated to the best of his abilities, but would wear jeans under his dancing attire or school uniform so that he wouldn't miss precious time at the stable at the end of the day. After years of pleading, and armed with $500 from his 16th birthday, Sid was forced to wait until a week before his 17th birthday to purchase his first gelding which was an American Quarter Horse. The rest was history. Although he cleaned an exhausting 80 stalls a day to support his habit, the serious minded student made time to hone his riding skills. Under the guidance of hall of fame horsemen Dale Wilkinson, and Bill Horn, Sid spent countless hours under the watchful eye of the masters developing his craft. After only 4 years of owning a horse, Sid's fierce dedication paid off. 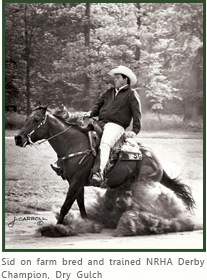 In 1971 at the tender age of 21, Sid won the prestigious National Reining Horse Association Open futurity which is one of the richest purses in horse showing . To this day, he is still the youngest rider in history to have accomplished this amazing feat. 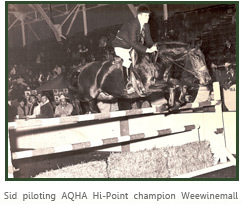 In addition to producing world class reining horses, Sid also trained or piloted top working hunter and jumping horses to numerous AQHA high point awards. Along the way, he has also ridden and trained successful western pleasure horses and has finished many AQHA champions as well. 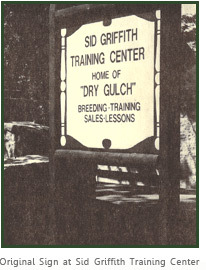 After his beloved father passed away in 1976, Sid returned home to care for his mother, and founded what is known today as Sid Griffith Equestrian Center. Today, Sid and his wife Leigh Ann, a former major retail executive, continue to own and operate the business on an impressive 50 acre historical property just west of downtown Columbus. Formerly home to the leading Standardbred stallions in the world, Griffith's purchased and transformed this beautiful farm into the largest private boarding and training stable in the greater Columbus area. Boasting over 100 stalls, multiple indoor and outdoor arenas, and black-board pastures, the facility is popular with riders of all disciplines. In addition to his resume as a seasoned competitor and trainer, Sid is also a multi association international horse show judge, including AQHA, NSBA, NRHA and USEF cardholder. Leigh Ann serves as the adjunct horseback riding professor at The Ohio State University, an account the Griffith's have serviced since 1976. Passing the horse bug on to their daughter, Dakota Diamond Griffith is the youngest of Sid's five children. Her favorite memory of elementary school was carrying jeans in her book bag, and pulling them on during the bus ride home. Dakota would discard her uniform and book bag in the yard each day and race to the barn. Maximizing her riding time was important to this energetic youngster, just as it had been to her father as a boy. 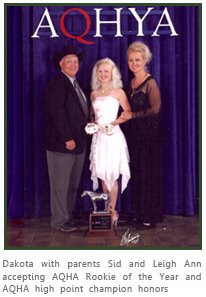 After winning the AQHYA Rookie of the Year award in 2003, Dakota was well on her way to setting records of her own. Boasting nearly 2,000 lifetime AQHA points at the youthful age of 17, Dakota has already amassed nine national high point titles. 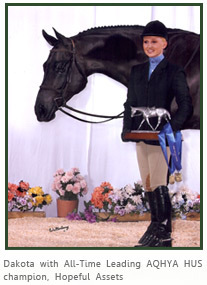 In September, 2009, Dakota reached an ultimate goal by making her mare, Hopeful Assets, the highest point earning AQHYA hunter under saddle horse in history. This was accomplished as a one horse/rider combination in just over 3 years of competition! Dakota also won her first open division title at 16, piloting Hopeful Assets against the nation's top trainers to the High Point Open HUS mare honors in 2008. After studying under some of the greatest horsemen and women in the industry, Dakota currently breaks and trains all the facility owned prospects and show horses. With a passion for politics, Dakota serves as the current National Snaffle Bit Association Youth President and as an AQHYA national director. She also enjoys working as a popular journalist for the prestigious equine online publication, GoHorseShow.com. Sharing a true love for people and horses, Dakota and her brother, farm manager Tyler Griffith make a great team. Tyler and his wife Heidi are also farm residents to insure 24 hour service for SGEC customers and their horses. 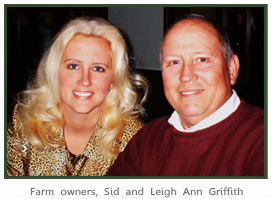 Griffith's other three children love the farm, but are pursuing other careers. Sarah, and her brother Jeffrey are both married, and are associates in a family owned business. Between the two siblings and spouses, they chase 7 young boys. Sid exclaims that he can't buy a granddaughter! Youngest son Zack, is a successful golfer, having studied as a resident student at the prestigious David Ledbetter Golf Academy in Bradenton, Florida. 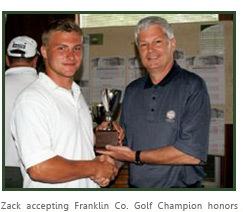 Currently a college student, Zack has won the Franklin County Amateur golf tournament among others, and club champion honors. Zack also earned three high school letters in football, and was an all-star team quarterback. With the next generations secured, SGEC looks forward to serving the Columbus community for another 30+ years.